So I shifted religious gears a bit today, from Hinduism to Buddhism, as I took a little day trip out to Sarnath, which is about 12 km away from Varanasi [However, it still takes roughly an hour to drive there–I believe I have mentioned that the traffic is not to be believed!]. Sarnath is the place where the Buddha came to preach his first sermon after attaining enlightenment, and as such, it is one of the four most important sites for Buddhist pilgrims today. I found it to be a nice change from Varanasi–it is much quieter, and there are far fewer people: lots of Asian tourists, however, as you might imagine! Just to put Sarnath in context a bit, the story is recounted in Buddhism how, after the Buddha attained enlightenment [and, we are talking about roughly the 5th century BCE], sitting under the bodhi tree [more about that in a minute], he then travelled to Sarnath to find the five ascetics with whom he had previously kept company before he adopted the path of the middle way. 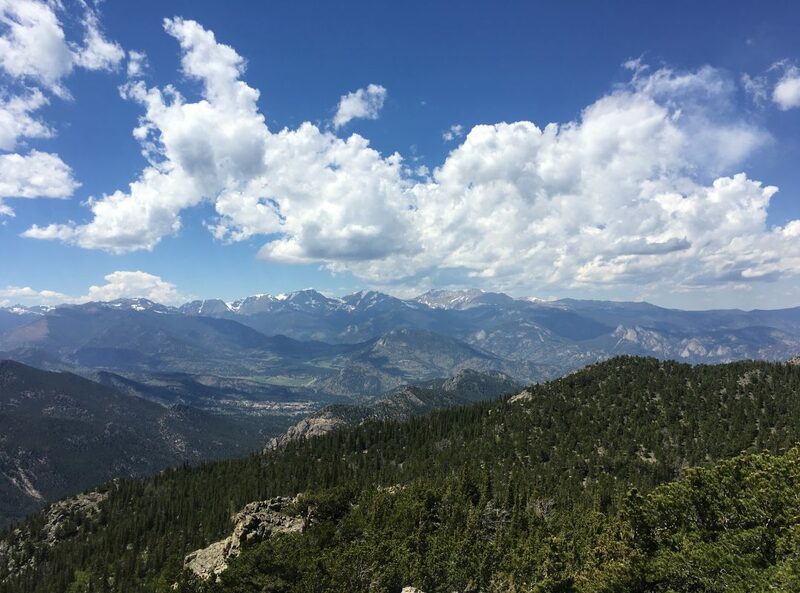 [Some versions of the story recount that after attaining enlightenment he despaired of there being anyone who could understand and accept the truth about the nature of being and the path to liberation, but the Hindu gods–Brahma and/or Indra–convinced him to try.] 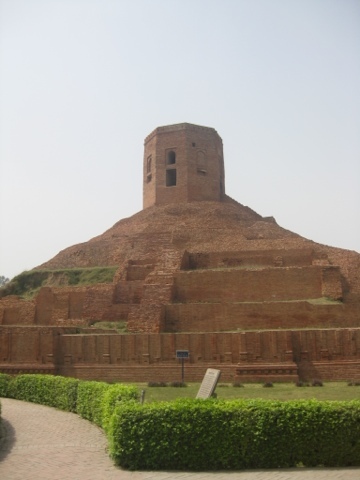 The picture below of the stupa [literally “heap”–stupas are the oldest Buddhist monuments and they typically have/had relics of the Buddha within them] with the incongruous tower on top marks the spot where the Buddha first met the five ascetics who would become his first disciples. 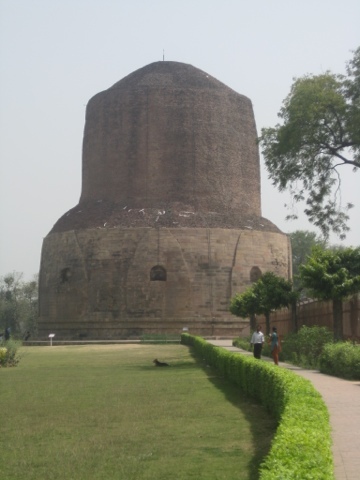 The picture of the large tube-like monument is the Dhamekh Stupa, which marks the place where the Buddha actually preached the sermon [let’s say thereabouts]. One of the reasons why the accuracy of these stupas is not disputed is first, the age of the monuments themselves–some of the brickwork on the Dhamekh Stupa dates back to 200 BCE; but another is the legacy of Ashoka, the great Indian emperor who ruled the entire country in the 3rd century BCE. He converted to Buddhism after repenting of the carnage of a great war he had initiated, and became extremely zealous for the faith–like many new converts, only he actually had the power to do something about it! Ashoka dedicated himself to the spread of Buddhism all through South Asia and beyond, and constructed many, many Buddhist stupas. As such, it is said that Ashoka had a big part in promulgating Buddhism as a world religion, expanding it far beyond its place of origin. One of the most famous monuments of Ashoka is what is called the “Ashoka Pillar.” The ruins of the base of the pillar, erected in in the 3rd century BCE, still stand in their original place, right near the Dhamekh Stupa, but the most famous part of the pillar, its capital [that is, its crowning carving], is in the museum next door [Also in the museum is the most beautiful carving of the Buddha, said to be the culmination of the Gupta style of art–it was done around the 4th century CE]. The capital is beautiful, carved into four lions all standing back to back. 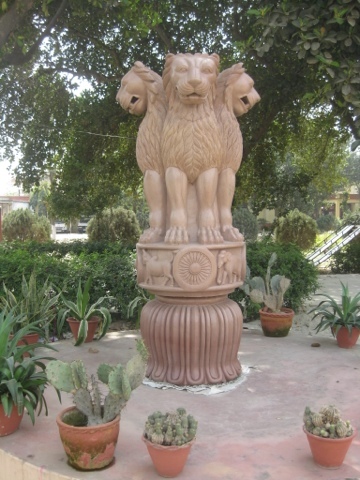 This symbol has been adopted as the National Emblem of India and the wheel, the “Ashoka Chakra” from its base, was placed onto the center of the National Flag of India. The picture below is a replica, from the Thai temple nearby [there are many different contemporary Buddhist temples here now–and also one Jain temple I saw]. One of the most interesting new temples in Sarnath is the Mulgandha Kuti Vihar, completed in 1931 by the Mahabodhi Society [temple picture below]. 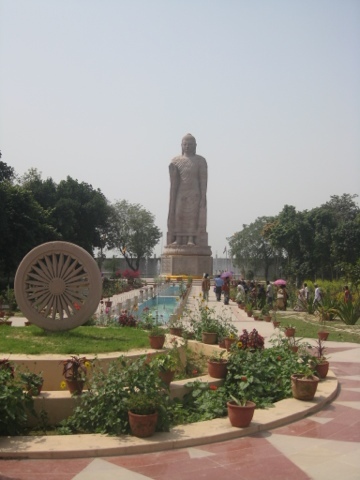 This society was founded in 1891, for the purpose of restoring Buddhism to India [it had died out centuries earlier, thanks in no small part to the all-encompassing embrace of Hinduism], and for restoring the Buddhist shrines at Bodhgaya [the site of the Buddha’s enlightenment], Sarnath, and other holy places. This temple is very beautiful, and every day, monks chant the text of the Buddha’s first sermon. This sermon, incidentally, is called the first turning of the Wheel of Dharma: in this sermon, the Buddha preaches the Four Noble Truths, which tells of the true condition of reality as it is typically experienced, and the way to attain enlightenment, and liberation from the cycle of birth and death. The coolest thing in this particular temple complex is the bodhi tree, which was transplanted from a sapling taken from a sacred bodhi tree in Anuradhapura, Sri Lanka in 1931. 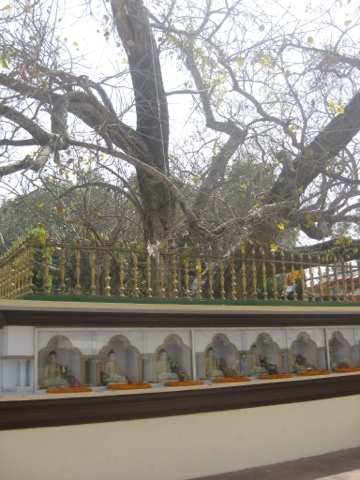 THAT tree was transplanted in 288 BCE (by order of Ashoka) from a cutting of the original bodhi tree under which the Buddha attained enlightenment. The picture of this tree is below also. Next: Next post: Oops–the Mulgandha Kuti Vihar Temple!